The Fun Way To Teach Kids About Money! 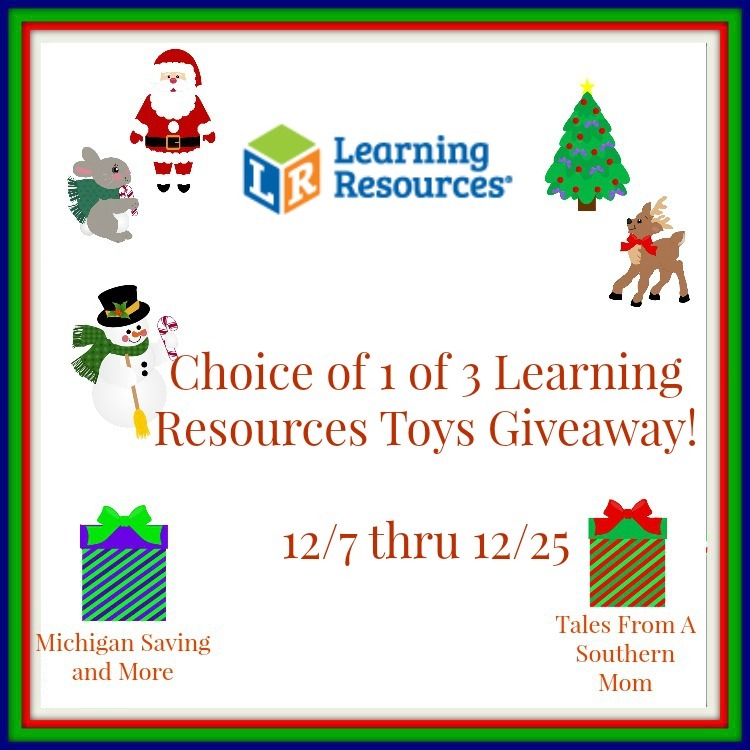 Deliciously Savvy is hosting a giveaway in which one lucky winner will receive 2 fabulous toys that make learning fun from Learning Resources! One winner will receive their choice of one of the items listed in this giveaway. So which one would you chose? This giveaway is in no way endorsed, affiliated, or associated with Facebook, Twitter or any other Social Media Networking Site. You are not eligible if you have won a prize from the sponsor in the last 12 month. This Giveaway is valid in the Continental United States Only and Entrants must be 18+ years of age to enter. This giveaway event will end at 11:59 PM (EST) 12/01/16. The winners will have 48 hours to email their information back to las93063 at gmail dot com or a new winner will be drawn, you may want to put this email address as safe as it could go to spam. The sponsors are each responsible for shipping of the above prizes. No blog associated with this contests are responsible for prize fulfillment. If you would like to be a sponsor in a giveaway like this please email Laura Smith at las930 (at)gmail (dot) com. If you take an entry you must stay following for the entire contest or you will be disqualified. Brew and sip coffee just like Mom and Dad! A handy to-go mug makes this set perfect for at home or on the go. Three delicious pastries make this set complete. 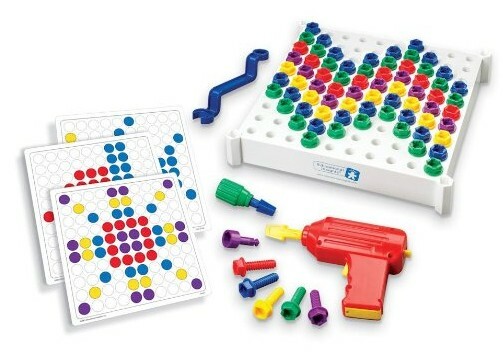 Plastic pieces are soft and durable for long-lasting fun! Create-a-Maze is an ever-changing maze that challenges the mind and strengthens both creative and critical thinking skills. Activity Cards guide beginners to follow visual instructions with specific piece placement. Once mastered, children place pieces independently and develop strategies and spacial reasoning by tilting the rocker board and moving the ball through the maze and towards the goal. The more complex the path, the more perseverance and creativity is needed to solve. Build your own tasty creation of spinning sweets and twirling treats! This delightful set includes brightly colored lollipops, cupcakes, ice cream cones, stickers, and more! Watch as the delicious treats all spin with the simple twist of the gear handle. Colorful mix-and-match pieces add to the fun and allow for endless combinations of designs. Compatible with all Gears! Gears! Gears!® sets for even more fun! Filed Under: Expired Giveaways / Winners Tagged With: Create-a-Maze, Gears! Gears! Gears!, Giveaways, LEARNING RESOURCES, New Sprouts Brew It! 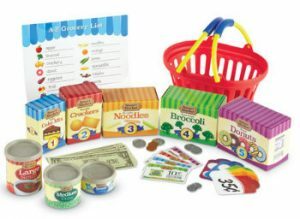 Deal of the Day: Save 50% Off Select Learning Resources Preschool Toys for 11/19/2015 only! Today only, save 50% on select Learning Resources Toys. Also, for an even greater value, take advantage of FREE Shipping (restrictions apply) and Prime (restrictions apply). 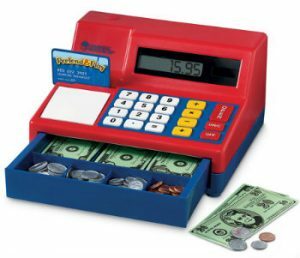 Today only, save on educational toys from Learning Resources, including the Teaching Cash Register, the Sneaky, Snacky Squirrel Game, and more. Today only, save 50% on select Learning Resources toys, including the teaching cash register, pretend & play fishing set, and more. It’s our Gold Box Deal of the Day! Also, for an even greater value, take advantage of FREE Shipping (restrictions apply) and Prime (restrictions apply). This one-day offer is valid on November 20, 2014, or while supplies last. Discount is already included in the current Amazon.com price. Applies only to purchases made from Amazon.com and does not apply to products purchased from third-party merchants on the Amazon.com website. It’s dinner time! Mouth-watering, healthy dinner foods are made of soft, durable plastic and sport a contemporary look! Includes a glass of milk, steak, grilled chicken breast, asparagus bundle, baked potato, broccoli, corn, empty bowl, 3 lettuce leaves, 2 tomato slices, 2 cucumber slices, pineapple ring and ice cream sandwich. Check out the complete review of this product from So Cal Coupon Mommy HERE. Learning Resources® is a leading global manufacturer of innovative, hands-on educational products trusted by teachers and parents and loved by children. The Company’s 1100+ high-quality products are sold in more than 80 countries, serving children and their families, preschool, kindergarten, primary, and middle-school markets. Among the Company’s brands are Pretend & Play®, Smart Snacks®, New Sprouts™, Gears! Gears! Gears!®, Primary Science, now! Board™, simple technology, Hands-On Standards® publications, Rainbow Fractions® and Reading Rods®. Disclosure: MumbleBeeInc was not compensated for the promotion of this review and/or giveaway. All opinions are 100% our own and were not influenced in any way. Facebook, Twitter, Pinterest, Google, and any other social media are not affiliated with this giveaway. This disclosure is done in accordance with the Federal Trade Commission 10 CFR, Part 255 Guides Concerning the use of Endorsements and Testimonials in Advertising. The sponsor(s) will be responsible for product shipment to winner(s) of this giveaway. MumbleBeeInc is not responsible for product shipment/delivery. This time around I received the New Sprouts – Cook It! My Very Own Chef Set. This an awesome set of pots and pans for any little one that is always wanting to help cook, bake, etc in the kitchen. They are the perfect size for little hands but look just like the ones Mommy and Daddy use. I also love all the wonderful colors that are used. In addition to being super cute and durable I love that everything stacks together for easy clean up and storage. In addition to making it easy to store it also helps you keep track of the items, so you will know what is missing and look for the item before too much time has passed. Good-looking cooking for the littlest chefs! Modern, 6-piece set features soft, rubberized parts and easy-grip handles—perfect for play! Includes pan, strainer, pot, lid (fits on both pot and pan), slotted spoon and serving spoon. Pieces stack for compact storage. Another thing I really love about this product is that its safe to use in the dishwasher and its food safe so your little once can really enjoy themselves without you having to worry. Overall yet another amazing toy from the people at Learning Resources! This one retails for $24.99 on their website and you can check out more information HERE. GIVEAWAY – the BEST Part! Event hosted by So Cal Coupon Mommy Please contact info@socalcouponmommy.com with questions or to see your business or blog featured on the next big event! A delicious way to develop shape and color identification! Cupcakes pull apart to reveal shapes. Match the shapes to put them back together. Then match the shape to the pan bottom. Featured shapes align with grade K Common Core Math Standards—circle, square, triangle, rectangle, oval, hexagon, star, and heart. They created these the perfect size for little hands, they can easily get a hold of them and do what they want as far as putting them together and adding them to the pan. I love all the amazing, bright and viberant colors that they used for these cupcakes. They make them fun and attractive to the little ones. This one retails for $17.99 on their website and you can check out more information HERE. Please contact info@socalcouponmommy.com with questions or to see your business or blog featured on the next big event!